Simon Reynell, the curator of the fine imprint Another Timbre, has launched a page on his web site entitled The Anonymous Zone. His intention – to provide a place where music can be listened to and appreciated for what it really is, not because of who made it – will likely generate debate, the sorts of digressions these debates invariably spawn and, with any luck at all, some degree of genuine effort by some listeners to face their own intransigent listening habits, and reflect on their function. The AZ offers sound files sans authorship, and encourages listener responses; like that feature from the Grey Lady of the jazz realm, Down Beat magazine’s Blindfold Test, and its contemporary music iteration, The Wire’s Invisible Jukebox, one is tempted, upon hearing the inaugural 12 sound selections Reynell has posted, to immediately guess the identities of the musicians involved. We are so trained, reflexively ransacking memory, grasping after analogies to what we are hearing, and lapsing, more quickly than we’d care to admit, into evaluative conclusions about good and bad. And guessing authorship. The blindfold tests were always fun for me, and I have engaged in these with musicians who have been guests in our home. Those found in Down Beat produced gems like Mingus’ 1960 response when played an Ornette record – it’s like playing wrong right. Equally entertaining are the improbable number of musicians who have failed to recognize their own work when it is played for them in this format. But this sport is a test of a different sort, and the invisibility of the jukebox is only an extension of Leonard Feather’s decades-old feature; the AZ has a slightly loftier, essentially two-fold aim: to challenge what Reynell calls the star system found in the tiny firmament of EAI music, and to contend with the role authorship has in shaping our preferences and favorites. Anyone who comes to this project, and its premises, without spending a little time on the music fora dedicated, in part, to the area of music Another Timbre has cataloged for years, will wonder what star system? Some, even the high post-count habitues of such fora, will argue against Reynell’s premise. 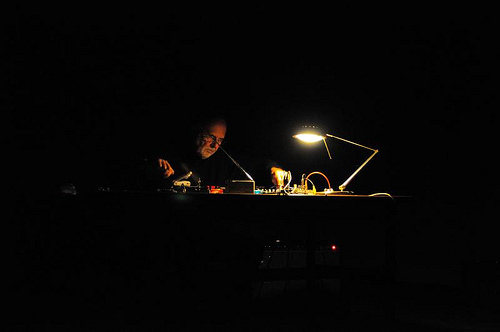 Nonetheless, the anonymity of the music found on the AZ can tease out some basic principles of how we listen to contemporary composed and improvised music. To my way of thinking, these intransigent habits of listening might at least be clarified by the AZ experiment, whatever the results of the more difficult work of trying to remove them from our listening experience. Anonymity can be regarded as placing the principle of unbiased listening before the inarguably powerful influence authorship has on our listening. The trade of authorship, wrote George Sand, is a violent and indestructible obsession. She would know. I doubt Reynell is suggesting our preconceptions in listening result in consequences as dire as those Sand faced, but the trade of authorship is a pith phrase; it is inevitable, I think, that EAI’s listeners bring to the tiniest of musical firmaments the habits they acquired in popular culture – creating hierarchies of name, style and status. 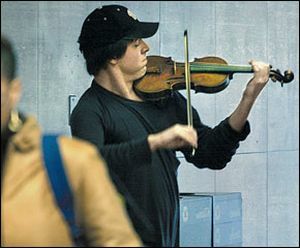 No doubt Reynell is familiar with the 2007 Washington Post- engineered anonymous busker experiment; the Post had classical rock star Joshua Bell play to passers-by in the subway system, essaying pieces like Bach’s Chaconne on an 18th-century Stradivarius. to an indifferent (well, he did find $32 in his open violin case, following a 50 minutes performance) audience. Bell reviewed the security camera tape that captured the entire gig, and, to his credit, laughed and cringed at the indifference his impassioned playing of seven favorite pieces met with. The Post called the Bell busk an experiment in context, perception and priorities. Reynell might say the same. What role does memory play when we see the name affixed to a piece of music – our personal history with the author, our recollection of what others say about them, the concomitant cache of status they carry, the opprobrium heaped on their heads, our inchoate expectations, our overt ones, the predicates, and oppression, of expectations. What role does anonymity serve? Is the music clarified in any way by anonymity? Does anonymity decenter / deflate the individual’s cached cred, filed in our personal retrieval system of taste and preferences? Whence biases, if you can’t be certain you’re listening to ______? How much of our response to a music is informed / contaminated by personality-driven opinions (e.g., Mattin)? What does authorship afford us? Certainly an opportunity to contextualize the musician’s work with a macro perspective, a means of considering the work in terms of thematic material, approaches, capitulations and conservatism. But to begin again, as a listener, what is afforded that offsets the compromised state in which we listen, bearing, as we do, preconceptions and other influences? How important (analogies in the visual arts abound!) is authorship? How did I approach listening through these untagged offerings? Primarily, super-aware of all these habits that toss me away from listening, here and now, to just the music. Simone Weil wrote, A work of art has an author and yet, when it is perfect, it has something which is anonymous about it. I don’t think any musician can, with the best of intentions (paradox noted), improvise nor compose free of influences. Neither do I think the listener can listen unencumbered by what’s gone before. I do think Reynell’s Anonymous Zone can bring us to a greater discernment between what is extraneous in how we listen, and what is essential. Part Two of this piece will be some responses I have to the music posted at the Anonymous Zone. This entry was posted in music writing on July 3, 2012 by jessewgoin. I just discover your blog which is really interresting. I added it to my own.